PHOTO BY JILL GOSCHE Calvert's Connor Meyer controls the ball as he is defended by McComb's Jacob Case during the game at Lakota Tuesday. KANSAS — Down two points to McComb with about a half-minute left in regulation Tuesday, Calvert’s Corbin Kantner missed a contested shot under the basket, but the ball was deflected back to Connor Meyer deep on the left wing. For the Calvert senior, there wasn’t any hesitation about what to do with the ball. “I don’t like going for ties,” Meyer said. 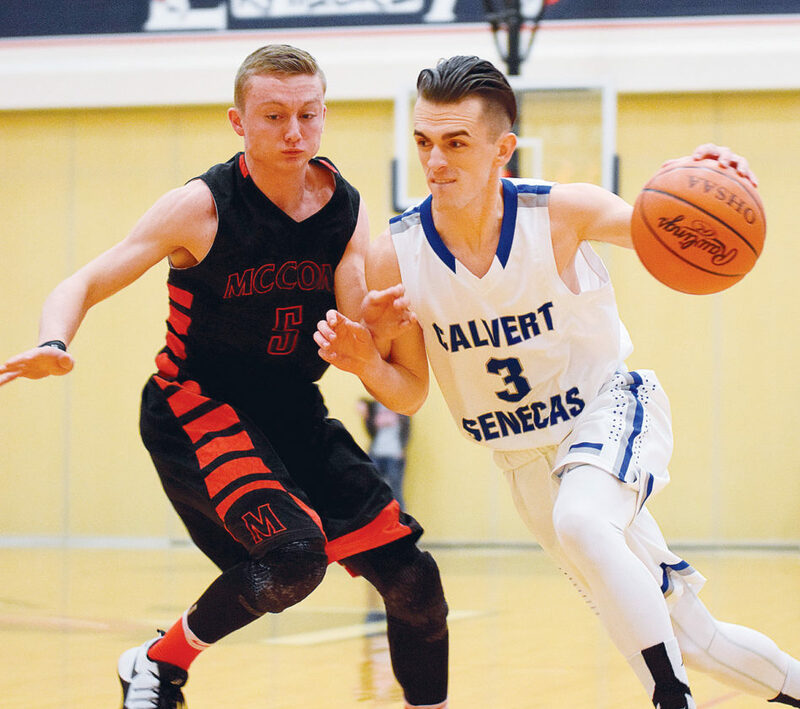 His 3 with 26 seconds left gave the Senecas a 44-43 lead, and after some key defensive stops, Calvert defeated the Panthers in the Division IV sectional semifinal, 49-43. The Senecas (10-13) advanced to Friday’s final here, where they will play Old Fort at 6:15 p.m.
Getting through Tuesday’s game was tough. The Senecas had two key players — seniors Kantner and Peyton Deats — fall ill this week. The pair played, but neither player started and neither scored. Instead, the Senecas were led by Meyer’s 14 points, and by Connor Kennedy, who had 12 points and nine rebounds. And Nic Somodi came off the bench to get five points, and made some key defensive plays. But it was Kantner’s shot that turned the game. “It was a catch-and-shoot thing,” said Calvert coach Ted Willman. “Plays like that all year long went against us. It was good that we got one to go our way. After Meyer’s 3, McComb was — at first — whistled for stepping over the line on the inbound play. But it was later ruled, after an officials’ huddle, that Calvert had called timeout before the turnover, a call Willman disputed afterward. But it didn’t matter, because Somodi was able to steal the ball on the Panthers next possession, and got the ball to Meyer, who was fouled. Meyer sunk two free throws with 15.1 seconds left to extend the Senecas’ lead to 46-43. McComb was able to get the ball in, but had trouble getting it over the timeline, and coach Nicholas Latta burned a timeout. But that only created another problem. The Panthers were unable to inbound the ball from the sideline, and were whistled for five seconds. Latta, who apparently felt the count was fast, was issued a technical after arguing, and Meyer’s ensuing free throw essentially ended the game. McComb finished the season at 3-19. Justin Wasson finished with 16 points, and Jacob Cose had 10 points and six rebounds to pace the Panthers. Park Hemminger had eight points for the Senecas, while Alex Keller had six. Calvert had a 15-6 lead after the first quarter, and held a 26-23 advantage at halftime. But a cold spurt in the the quarter — the Senecas didn’t score until Somodi’s free throws with 1:51 left in the period, allowed McComb to grab the advantage. It led 35-32 after three. But the Senecas got going in the fourth, scoring on seven of their final 10 possessions. Now, Calvert will go up against the SBC River champion Stockaders, who have defeated the Senecas twice this season.